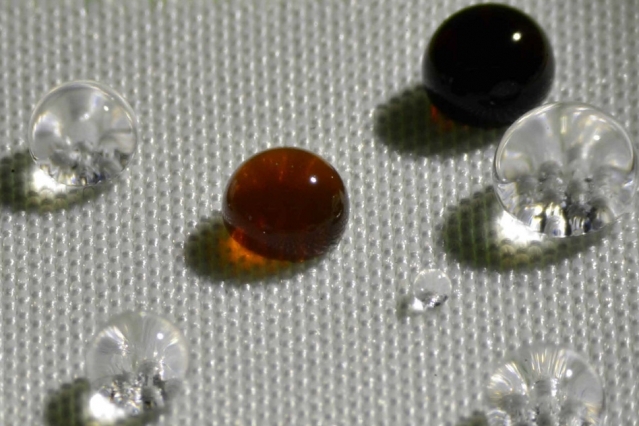 A team at the Massachusetts Institute of Technology (MIT) has come up with a coating that not only adds water-repellency to natural fabrics such as cotton and silk but is also said to be more effective than the existing coatings. The new findings are described in the journal Advanced Functional Materials, in a paper by MIT professors Kripa Varanasi and Karen Gleason, former MIT postdoc Dan Soto, and two others. “Most fabrics that say water-repellent are actually water-resistant,” said Prof Varanasi, who is an associate professor of mechanical engineering. “If you’re standing out in the rain, eventually water will get through.” Ultimately, “the goal is to be repellent — to have the drops just bounce back.” The new coating comes closer to that goal, he says. Because of the way they accumulate in the environment and in body tissue, the EPA is in the process of revising regulations on the long-chain polymers that have been the industry standard for decades. “They’re everywhere, and they don’t degrade easily,” said Prof Varanasi. The coatings currently used to make fabrics water repellent generally consist of long polymers with perfluorinated side-chains. The trouble is, shorter-chain polymers that have been studied do not have as much of a water-repelling (or hydrophobic) effect as the longer-chain versions. Another problem with existing coatings is that they are liquid-based, so the fabric has to be immersed in the liquid and then dried out. This tends to clog all the pores in the fabric, Prof Varanasi says, so the fabrics no longer can breathe as they otherwise would. That requires a second manufacturing step in which air is blown through the fabric to reopen those pores, adding to the manufacturing cost and undoing some of the water protection. Research has shown that polymers with fewer than eight perfluorinated carbon groups do not persist and bioaccumulate nearly as much as those with eight or more — the ones most in use. What this MIT team did, Prof Varanasi explains, is to combine two things: a shorter-chain polymer that, by itself, confers some hydrophobic properties and has been enhanced with some extra chemical processing; and a different coating process, called initiated chemical vapor deposition (iCVD), which was developed in recent years by co-author Karen Gleason and her co-workers. Using the iCVD coating process, which does not involve any liquids and can be done at low temperature, produces a very thin, uniform coating that follows the contours of the fibers and does not lead to any clogging of the pores, thus eliminating the need for the second processing stage to reopen the pores. Then, an additional step, a kind of sandblasting of the surface, can be added as an optional process to increase the water repellency even more. “The biggest challenge was finding the sweet spot where performance, durability, and iCVD compatibility could work together and deliver the best performance,” said Dan Soto. The coated fabrics have been subjected to testing in the lab, including a standard rain test used by industry. The materials have been bombarded not only with water but with various other liquids including coffee, ketchup, sodium hydroxide, and various acids and bases — and have repelled all of them well. The coated materials have been subjected to repeated washings with no degradation of the coatings, and also have passed severe abrasion tests, with no damage to the coatings after 10,000 repetitions. Eventually, under severe abrasion, “the fiber will be damaged, but the coating won’t,” he says. The team plans to continue working on optimizing the chemical formula for the best possible water-repellency and hopes to license the patent-pending technology to existing fabric and clothing companies.